A semi-trailer driver whose truck recently plunged off an overpass on I75 near Tampa was cited for using a cellphone while operating a commercial motor vehicle. The driver was unable to control his truck and swerved after another vehicle changed lanes in front of him. Why? A dashboard video camera mounted in the cab of the truck showed the driver steering with only one hand while tapping on his cellphone. When he finally looked back at the road, he quickly grabbed the wheel and overcompensated in a swerve. The prevalence of new technology in vehicles as well as along roadways can help save lives but can also help clarify what occurred in an accident. A dashboard camera, or dash cam, is a great example of this type of technology. Dash cams are video cameras that are mounted to the inside of the windscreen or the top of the dashboard. The camera continuously records its view and also supplies a date and time stamp to the recording. Many commercial trucks are equipped with front-facing dash cams to film the external environment ahead of the truck as well as the driver to monitor driving behaviors. This is the type of camera that caught the driver involved in the Tampa accident as he illegally texted on his phone. The video captured on truck dash cams can contribute evidence after an accident. For example, the data can show that the driver was traveling at a too-high rate of speed, or was making a risky or illegal pass. Can Dash Cams in Trucks Reduce Accidents? 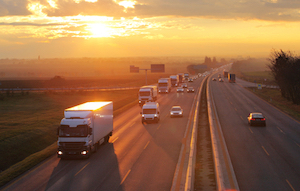 In a 2015 article from TruckingInfo.com, two trucking firms confirm that their fleets have experienced benefits since deploying in-cab video systems along with other safety technologies including lane departure warning, reactive cruise-control and stability control systems. As another benefit, videos of actual risky driver behavior are useful when training new drivers. Tractor trailer vs. car accidents can be catastrophic in terms of injuries and fatalities, largely due to the huge difference between the size and weight of the vehicles. Dash cam technology can save lives by highlighting dangerous and reckless behavior as well as help prove fault in an accident.